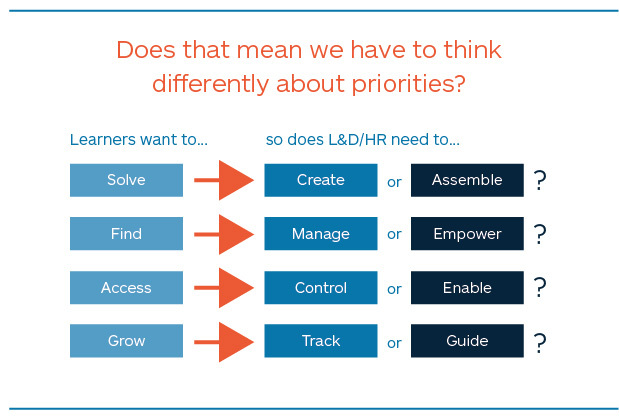 What would you do if you could build a vision and strategy for learning at your company completely from scratch? What would your structure and plan be? What specific things would you continue doing and what would you do differently? The world of learning and work is changing dramatically so you may want to consider a few different areas as you think about your learning vision of the future. How would you imagine the perfect learning culture? Company cultures that support learning as a core, fundamental part of everything employees do every day are realizing their competitive advantage. Also, cultures that identify learning as a key guiding principle enable employees to continue to build the skills that they need for the future. Does your culture put learning front and center? I know when I ran learning organizations at Sun, Yahoo, and LinkedIn, we thought that we had to create most of the learning content ourselves. But now, there is so much content out there, you may not need to create all your own anymore. The perfect balance is probably a little of both. What would a new content strategy look like in your company? Technology is another component of your vision and strategy that can easily be reimagined. Your employees want to learn on-demand and they need personalized content that fits their particular needs. How can you think about learning technology in a new way – in a way that supports what the learner really wants and needs to build relevant skills for the future? Imagine a technology that incorporates curated content, personalization, social features, analytics, and skill plans as the platform that could support your learning strategy. Learning analytics and insights are key to understanding what your employees are learning and what skills they are building. Does your learning strategy incorporate analyzing learner data and agile improvements so that you can validate and refine your strategy on an ongoing basis? What about the people in your learning organization? Do they have the skills and expertise to take you to the future? They are expanded and different than what might have been enough in the past. For example, do they know how to curate content and analyze learning data? Can they facilitate online peer-to-peer learning or incorporate video content into in-person training? These are just some of the skills that the learning organization of the future will need. Vision, strategy, culture, content, technology, analytics, and people. These are just some of the topics I’ll be discussing with Christopher Lind, Learning Experience and Digital Transformation Leader for GE Healthcare at our upcoming LENS conference in Chicago on September 28. I hope you’ll join us so that together we can develop the structure for making your vision a reality.